Hotel Arenas Blancas belongs to the complex Barcelo Solymar Arenas Blancas Resort, and is located in a magnificent beach area in Varadero, one of the most impressive beaches in the world. Also known as the Blue Beach, it got in 2012 the certification of Environmental Beach, and includes more than 20km of fine sand and crystal clear waters. 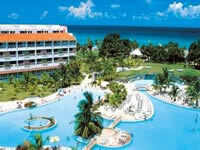 Arenas Blancas is only 200 meters away fron the center of Varadero town. This exclusive resort, surrounded by beautiful gardens, offers several bars and restaurants, pools, all day animation for children an adults, a variety of sports and activities as a part of Barcelo All-Inclusive program. In addition to buffet restaurants, clients may enjoy Italian, Spanish, Seafood and Creole restaurants a-la-carte.